American football in Japan Corporate sponsorship has long been a major pillar of sports in Japan, supporting everything from little league baseball to company rugby teams to major soccer and motorsports teams. In many cases sports are so dependent on this money they would struggle or cease to exist without it. In addition to professional sports teams, Japan also has a large number of company teams with first-rate players, cheerleaders and mascots, and extensive media coverage. "After World War II," reported the Wall Street Journal, "when companies wanted to instill maximum employee loyalty, and people wanted cheap entertainment after a hard day's work, some companies spent about $3 million a year on uniforms, ball parks and pro-quality players." "As Japan grew rich, the companies spent more on serious fun," the Wall Street Journal reported. "Company baseball, volleyball, football, basketball and ping-pong teams became key parts of the national image. The best college players were eagerly recruited...as were top foreign players. With player salaries sometimes exceeding $200,000, mere office work necessary to ensure amateur status---was a costly waste of time. Most players spent only a few hours a week behind a desk." Corporate teams are supposed to be made only of amateur players. But this is as much the case as it is in the Olympics. It is estimated that “amateur” players on corporate basketball teams earn around $200,000 a year. During the recession in the 1990s many companies were forced to cutback on their expenses for sports. Some of the better players were able to transfer to companies that kept their sports teams. Others stayed with their companies, quit sports, and became regular salarymen. In corporate and industrial baseball only 80 teams are left from 237 in the early 1990s. Some players have gone to the United States and found spots on minor league teams. Players in other sports have had to get regular sports. The economic crisis in 2008 and 2009 caused many companies to give up their company sports teams and cut back on their sponsorship money even more. Among those affected was the 37-year-old Seibu Prince Rabbits hockey team. The team cost $5.1 million a year to maintain but only drew an average of around 1,000 people to its games. 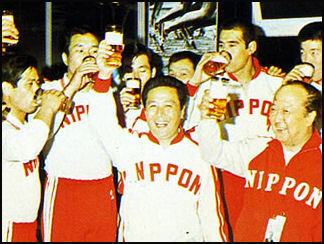 The team was 11-time national champs and Asian League champion twice, and had been around since Japan’s top hockey league was launched in 1966. To keep teams and leagues alive, players started managing their own teams and found new sponsors and fans organized petition drives to urge companies to continue funding their teams. One American football team collected trash in a park to draw attention to its plight. Other casualties of the global financial crisis in 2008 and 2009 have been Honda’s Formula One team and Mitsubishi’s and Suzuki’s rallying teams. 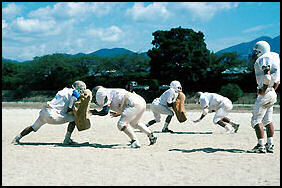 Dakyu is traditional equestrian, ball-and-goal which resembles lacrosse played on horseback. Over a thousand years old, it is rarely played any more. The 77-kilogram, 1.85-meter Japanese goalie Yutaka Fukufuji, who has signed with Los Angeles Kings in the NHL, hopes to be the first Japanese to play in the NHL. In 2005 He played for the Bakersfield Condors. 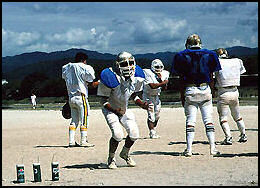 American football in Japan American football is played in high school, college and the X-League. The sport was introduced in 1934 by Paul Rusch, a teacher who taught in Japan and organized teams at three Tokyo universities. Japanese took to he sport quickly, with some games drawing up to 25,000 people. Each year the NFL plays an exhibition game in Japan. The game is called the American Bowl. Often the teams have a Japanese player on their team. The Atlanta Falcons and Indianapolis Colts played a pre-season game at Tokyo Dome in August 2005. VIP seats sold for $400. The cheapest tickets were $40. Japan won the World Championship of American Football in 1999 and 2003, defeating Mexico in the finals both times. Those years the Americans did not participate in the a six team tournament.Some say the best American football played outside the United States is played in Japan. Japan finished third in the 2011 World Championship of American Football in Vienna, Austria.. It failed to reach the final. Losing to Canada in its round robin group, but took third after defeating Mexico in the consolation playoff. Founded in 1971, the X-League is comprised of 60 corporate teams, including the Fujitsu Frontiers, Asahi Beer Silver Star, Inward Skylarks, Hosei University Tomahawks, Obic Seagulls, Matsushita Electric Works Impulse, two American teams, and team from the Nation Police Agency. The season is comprised of five games and the league is broken into four tiers with the best teams in each tier challenging the worst teams in the tier above them for them for promotion. The season ends with three round of play of, followed, not by Super Bowl but by---you guessed it---the Rice Bowl. Football doesn't make that much sense for Japan because it requires large expenditures for equipment and a large amount of space for a team to play. The X-League has a relatively small following and is kept alive by corporate sponsorship. The players receive no money but take the sport seriously and train hard and watch films just like he pros in the U.S. . The Rice Bowl in early January is a competition between the X league champion and the university champion. The Pearl Bowl is the final game of a tournament between corporate X-League teams from the Tokyo area that takes place of the Tokyo Dome in June. The X-Bowl is game between the two best teams in he X League played in December. The Obic Seagulls won the X Bowl at Tokyo Dome in December 2005 defeating Matsushita Electric Works Impulse 25-16. The Seagulls were led by University of Hawaii graduate Kevin Jackson, the first foreigner to be named MVP. In the game he blocked two punts and forced a fumble. The Onward Skylarks won the X Bowl at Osaka’s Kyocera Stadium in December 2006, defeating the Deers 24-21. The Skylarks scored the winning touchdown on a fake field goal. They team went on to beat Hosei University Tomahawks in the Rice Bowl. The Matsushita Electric Impulse defeated Fujitsu Frontiers 33-13, taking advantage of five turnovers, in the 2007 X Bowl. It was a record six titles for the Impulse. The Impulse played the collegiate champion Kwansei Gakuin university in the Rice Bowl in 2008. Matsushita won, taking its second national championship in four years, defeating the Kwansei Gakuin 52-38 in the highest-scoring Rice Bowl ever before a crowd 34,487. .
Ritsumeikan University stunned Panasonic Impulse in the Rice Bowl with a 17-3 in the Tokyo Dome in January 2009. Panasonic beat the Kajima Deers in the X Bowl in December 2008 in Osaka. Masafumi Kawaguchi for a long time was Japan’s most famous player, He played in NFL Europe and appeared in the American Bowl, playing for the Green Bay Packers, San Francisco 49ers and Dallas Cowboys but failed toe make any of these teams. The sumo wrestler Wakanohana tried to make the roster of the Arizona Rattlers in the American X-League but failed. American football is the only major North American sport that has not had a native-born Japanese player play in a regular season game. The Atlanta Falcons signed Noriaki Kinoshita, a receiver-kick returners, in 2007. He played in three pre-season games, catching one pass for 12 yards and returning three kicks for 64 yards but was released at the end of training camp. Kinoshita was a star player at Ritsumeikan University and played three seasons in NFL Europe with the Amsterdam Admirals, where he made a name for himself as a return specialist, leading the league with a 19.2 average on punts and a 29.9 average on kick-offs. . He continues in his quest to make it in the NFL. One of the key players on Japan’s national American football team is 42-year-old defensive lineman Yasuo Wakisaka, by far the oldest member of the team and older than most of the coaches. His career accomplishments include six Rice Bowl national titles--three each at both Nihon University and Panasonic--and five X-League championships. He is a seven-time All X-League selection. Basketball is reasonably popular. NBA games are shown on prime time and trips are offered to the United States to watch the top NBA teams play. The top professional league in Japan is the Japan Basketball League Super League, whose season ends in March and finishes with a four-tem playoff. This league has may American players and has been dominate the last few seasons by Toyota Alvarl. Other teams include the Panasonic Super Kangaroos, the Toshiba Brave Thunders, Aisin Sea Horses and the Hitachi Sunrockers. There isn’t a strong interest in basketball in Japan. You don’t see kids playing the game that much at playgrounds. The last time Japan made it to the Olympics in basketball was in 1976. Volleyball is a much more popular sport. The Japanese men and women failed to make it the 2008 Olympics in Beijing. It was a humiliation for Japan. Japan hosted the men’s basketball worlds championship in 2007 and embarrassed itself then too, going 1-4 and losing by 40 points to Spain and blowing an 18 point lead and losing to New Zealand. Kobe Bryant was named by his father after Kobe beef, which his father sampled on a trip to Kobe when he was a U.S. serviceman. In 2004, Yuta Tabuse became the first Japanese player to play in the NBA. The 173-centimeter, 75-kilogram guard played a total of 17 minutes in four games for the Phoenix Sun and had 7 points and four rebounds but was released before the halfway point of the season. In November 2005, Tabuse was cut from the Los Angeles Clippers. He played for the Bakersfield Jam in 2006 after being released from the Albuquerque Thunderbirds. One of the top players in Japan is J.R. Sakuragai, a star player on UCLA’s 1995 national title team as a freshman who was formally known as J.R. Henderson and became a Japanese citizens on 2008. He averaged 14.2 points and 6.4 rebounds at UCLA and was a second round pick who played 30 games in the NBA with the Vancouver Grizzlies. In 2002 he arrived in Japan after playing for teams in France, Las Vegas, Puerto Rico and the Philippines. In Japan he has played for the Asian Sea Horses, averaging 20 points and 10 rebounds, leading his team to championships in 2003 and 2004, and has been a seven time Japan Basketball League all star. As a Japanese citizens he has played with the national in the Asia championship in 2007. 1972 men's volleyball team The Japanese women's volleyball beat the Soviet Union in Moscow to win the 1962 worlds, then won the gold medal in the Olympics in 1964 and 1976 and the world championship in 1967 and 1974.In 1964 and received worldwide attention for their training methods, which included repeatedly diving on hard wooden floors for hours, digging out spikes. The gold medal match with the Soviet Union was the second highest rated television show ever, at 66.8 percent, and the No. 1 rated sports show of all time in Japan. Volleyball is the only team sport in which Japan has won gold medal. The women won again in 1976 in Montreal. The men won in 1972 in Munich. The Japanese women have also won the world championships in volleyball a record five times. They won it in 1966,1969, 1972, 1978 and 1981. Japan has won no major titles recently. The men’s and women’s volleyball teams have made it to the Olympics in recent years but have not won medals. Christopher Johnson wrote in the New York Times, “In a country where most students play volleyball in junior and senior high school, Japan has figured out how to mass-market a sport that, though played by millions around the world, rarely garners the global attention showered on soccer and basketball.” Describing the television coverage when Japan hosted the world championships in 2010, Johnson wrote, “For two weeks, TBS, one of the country’s largest networks, has been broadcasting Japan’s games in prime time, going head to head with the Japan Series, the finals of the professional baseball league, which ended last Sunday. In addition to selling advertising time, TBS profits from sales of cookies and cakes at 1,000 yen, or $12; T-shirts that depict the official mascot, Boonus, saying, “I love volley-boo”; and thousands of gold sticklike balloons that fans clap in unison. “It’s popular in Japan because the mass media get behind it,” Yoshie Takeshita, 32, a crafty setter known for her leaping ability and speedy saves, told the New York Times. “People see it on TV, so they want to come out to see it in person. This helps us as a team, because the fans give us energy on the court.” Saori Kimura, Japan’s top scorer, said, “It’s because the media are creating a big fan base for us.” Kimura, a shy 24-year-old, is one of the country’s most recognizable athletes. In November 2010, Japan upset the United States, and won a bronze medal in the women’s world volleyball championship in Tokyo in November 2010. The Japanese team bounced back after squandering a two-set lead against Brazil in the semifinals that could have earned a place in the finals. Top-ranked Brazil rallied to beat Japan 22-25, 33-35, 25-22, 25-22, 15-11 in the semifinal, and faced defending champion, Russia, in the finals. The United States, the Olympic silver medalist, lost to Russia, 16-25, 25-13, 19-25, 21-25. Perhaps the greatest obstacle that Japan has to overcome is the height of its players. “We are very short compared to the other top teams in the world,” Japan Coach Masayoshi Manabe told the New York Times. “It’s very difficult to block teams like Russia that are very tall. We have to work a lot harder on our defense and the precision of our play during the game. We are very focused.” In the past decade Russia has been led by Ekaterina Gamova, its 202-centimeter, or 6-foot-8-inch, spiker. Hiroyuki Shimoyama wrote in the Yomiuri Shimbun, “Japan and South Korea were neck-and-neck throughout the match--no set was won by more than four points. However, Japan scored at crucial moments to sweep its Asian rival. Ace spiker Saori Kimura was jubilant after the match, as Japan had lost to South Korea in the Olympic qualifying tournament in May. "Today I was able to use everything I've learned in the past," said Kimura, 25. "We've avenged the loss [to South Korea] and won the bronze medal--I'm really happy." Japan has had what it the Japanese regard as poor results in Olympic baseball. It won a silver medal in 1996 and no medal in 2000. Even though it was loaded with talent from Japan’s professional leagues at the 2004 Olympics in Athens, it could only manage a bronze medal after losing to unheralded Australia in the semifinals. In the bronze medal game, Daisuke Matsuzaka shut out Cuba for eight innings, leading Japan to a 6-3 victory. He allowed only four hits against a formidable Cuban team. At the Beijing Olympics in 2008, the Japanese team again was loaded with professional players from the Japan League that left their home teams in Japan to play in the event. Japan lost to South Korea 6-2 in the semifinals, dashing its hopes for a gold medal. Japan lead through seven innings. South Korea went ahead with an eighth inning two-run homer by Lee Seung Yeop, who also plays in the Japan League. South Korea played Japan twice, both times securing come from behind victories. Japan went home without a medal after losing to the United States---a team made up of 23 minor leaguers and one amateur---8-4 in the bronze medal game and finished without a medal. Japan’s woman’s softball team is highly rated. In the last three Olympics it won a gold medal in 2008, a bronze in 2004 and a silver in 2000. Most players on the team play for corporate team. The national team gets funding from the Japanese government. At 2008 Olympics in Beijing, Japan stunned the United States, winning 3-1 to take the gold medal. The United States was a heavy favorite. Before the game with Japan, the United States outscored opponents 57-2, while going 8-0 including a 4-1 victory over Japan the day before. The United States had won 22 straight games, often by outrageously lopsided scores, and hadn’t lost since 2000, in Sydney. The Americans had won every gold medal since the sport was introduced to the Olympics in 1996 and 2008 was the last year softball would be an Olympic sport. The Japanese pitcher Yukiko Ueno shut down the powerful American batters. She was clearly the star of the series. With a rocket for a fast ball, the 26-year-old right hander threw 413 pitches in three complete games over two days. In the game against the United States she threw strike after strike with speed and movement even though she had a huge blister on her pitching hand. To reach the finals Japan pulled out a 4-3 extra-inning win against Australia with Rei Nishiyama belting a home run in the 12th inning. In the game before that Japan lost 4-1 to the United States with the Americans scoring four runs in the ninth which allowed the Americans to reach the final. At the 2000 Summer Olympics in Sydney, the women's softball team won all their games until the gold medal match in which they lost to the United States 1-0 in extra inning and had to settle for the silver. The Japanese had beaten the United States in an earlier game, ending the American’s 112-game winning streak. In the Athens Olympics in 2004, Yukiko Ueno pitched the first perfect game in Olympic history, leading Japan to a 2-0 win over China.